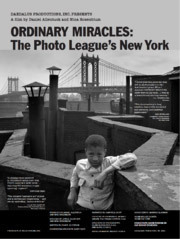 Ordinary Miracles: The Photo League's New York illuminates a significant 15 years in American photography history. The fond and visually rich documentary showcases striking images of New Yorkers in the 1930’s and 1940’s, and admiringly informs about the committed, enthusiastic artists behind the cameras, with lasting lessons about how they learned the art of socially committed photography together. Following a fortunately filmed 1999 reunion of Photo League members, directors Daniel Allentuck and Nina Rosenblum tracked down alumni who were involved during its exciting fruitful years of 1936-1951. In the depths of the Depression, they came together out of political and artistic frustrations, when leftist newspapers were covering strikes and protests, but cared more about the anti-capitalist political statements on the placards than the composition of the images. They wanted to figure out how to capture the difficult times and spur changes, but with an aesthetic eye. Comparisons to pedestrian photographs from the period are analyzed to distinguish them from the League’s concepts of heightened artistry in the service of a social consciousness, a sensitive subtlety that frequently gets lost in looking back at activist artists. That also explains why their vivid images continue to have more impact decades later. Through a narration by Campbell Scott, enthusiastic interviews with alumni (identified by the year they joined, many when they were just in their early 20s), curators, letters, League publications, contemporary reviews, and best of all, the many portraits they took of each other, activities and personalities are brought back to life. In their headquarters, which an alum fondly calls “bohemian”, there was space for exhibits, dark rooms, workshops, and intense discussions over aesthetics and photography as art and social force. They emphasize the importance of classes directed by the irascible, inspirational Sid Grossman, whose pointed criticism is remembered as terrific training to find the emotional center of a subject. The League found a united purpose after Ray Stryker lectured there in 1939 about his Farm Security Administration’s rural documentation project, which employed members including Dorothea Lange , and they decided to do a New York City version. Under Aaron Siskind and Morris Engel, “The Harlem Document” revealed poverty and neglect, but also showed a vibrant African-American street and night life of church-goers and jive dancers. Jack Manning describes how he found the League as a 17-year-old Stuyvesant High student (one of the few biographical tidbits from interviewees) and was immediately invited to join the project. Another alum recalls how he captured a wide view of parade watchers crowded on fire escapes. Some of the photographs, particularly of Harlem children, are still used to illustrate Depression documentaries, but with no sense they were originally part of a thematic series. The League moved on to other neighborhoods, including the Lower East Side, and some of the best sequences are alums returning to those sites, as when Walter Rosenblum (the co-director’s father) revisits the “Pitt Street Document”, looking down from the same roof. Their work was so influenced by the social photography of Lewis Hine that it’s surprising to learn it was the League, spurred by active member Bernice Abbott, who rescued his legacy and collection from obscurity shortly before he died in 1940, similarly saved Eugene Atget’s Parisian plates, and helped to revive the careers of Ralph Steiner and Henri Cartier-Bresson. Crime photographer Weegee’s lecture included practical advice: take your time to set up photographs at a homicide because the dead don’t move, while Ansel Adams’ lecture caused heated controversy because his landscapes lacked any people. Their heretofore scattered work in seemingly every branch of the military during World War II, including Omaha Beach on D-Day and Iwo Jima, reflects the influence of Robert Capa’s lecture at the League, to capture soldiers’ everyday experiences. Women were active members from the beginning, including Margaret Bourke-White, and many, such as Consuelo Kanaga, kept the League going while documenting the home front. But after they shot the victory parades, in 1947 the League was listed as a subversive organization, and, as one alum notes with sorrow, “We became an enemy.” With the rise of outlets like Life and Look magazines, photographers couldn’t risk the association. The black list had begun, and the League fell to the anti-Communist scare. While it’s wonderful to see lively nonagenarian Rebecca Lepkoff still actively going around New York with camera in hand, there is too little follow-up on others, even as their beautiful photographs quickly go by with evocative music selections. The filmmakers have made separate documentaries on individuals (the co-directors’ on Hine and Walter Rosenblum, and producer Mary Engel’s on her parents Ruth Orkin and Morris Engel), but the others deserve more biographical background here. Even too short, there’s enough here for PBS’s American Masters series to include it as a group biography, and lead viewers to seek out more of the photographers’ unique work. On a personal note, I wish I could time travel back to interview Photo League member Consuelo Kanaga while she was setting up one of her last exhibitions when I worked at Wave Hill in 1977, now that this documentary helped make me aware of her significance. Since August 2006, edited versions of many of my reviews of documentaries/indie/foreign films are at Film-Forward; since 2012, festival overviews at FilmFestivalTraveler; and, since 2016, coverage of women-made films at FF2 Media. Shorter versions of my older reviews are at IMDb's comments, where non-English-language films are listed by their native titles.